Episode 81 is live, enjoy! Just wanted to thank all the listeners who support the show as we have passed 20,000 downloads. It's a small but worthy milestone, thanks again! You can find the show at Warship Tactics Podcast Download the new Google Podcast App here Subscribe on Android Subscribe on Apple Podcasts Subscribe on Stitcher Subscribe on Spotify Follow me on Facebook at Maddminister Gaming Live stream on Facebook, Tuesdays at 5pm Pacific (midnight UTC) Follow me on Twitter at Maddminister@Warshiptactics Subscribe to my YouTube channel at Maddminister Gaming The Warship Tactics home page has a new player here with all episodes ready for your listening pleasure. Episode 80 is live, enjoy! Just wanted to thank all the listeners who support the show as we have passed 20,000 downloads. It's a small but worthy milestone, thanks again! You can find the show at Warship Tactics Podcast Download the new Google Podcast App here Subscribe on Android Subscribe on Apple Podcasts Subscribe on Stitcher Subscribe on Spotify Follow me on Facebook at Maddminister Gaming Live stream on Facebook, Tuesdays at 5pm Pacific (midnight UTC) Follow me on Twitter at Maddminister@Warshiptactics Subscribe to my YouTube channel at Maddminister Gaming The Warship Tactics home page has a new player here with all episodes ready for your listening pleasure. If you have not found Twitch streamers who provide what you are looking for seek out new grounds. YouTube, Facebook and Caffeine TV are other places you can find people streaming World of Warships. Just trying to help you out here as I know sometime finding that content creator who delivers information in a way that clicks for you can sometime be a challenge. High skill players like Flamu, Notster and Business6 to name a few can sometime be hard to follow for the newer player who is trying to understand game mechanics as they seem to just get away with stuff. When in actuality they just understand the game mechanics to the point of exploiting situations some may not even notice. Yes, they do describe what is going on but maybe not in a way the newer players fully understands. I feel the newer players need a bit more explaining and that could make a stream not as entertaining as watching a superunicum player just face roll for a few hours. Remember at the end of the day those streamers still need to be entertaining to continue to grow. Some like myself stream for more educational reasons in hope of getting some new players into that middle ground from a knowledge point of view. I hope you can find a streamer who clicks for you and enables the learning process to continue. Good luck and don't forget to have fun! Getting a card but I need to find the perfect one, just can't get any'ol card for him. I will also include a few of my unit patches, hope he don't mind getting those from a US Army Paratrooper! Turkey 261 here I understand how some of you did not like having multiple turkeys on your team yolo into the enemy and die less than 5 minuets into the game. When playing my turkey account 2 different times I had 1 or more turkeys on my team facing 2 or more on the enemy team and watched as they yolo'd. Then reading chat just to see the displeasure from the teammates at those actions. I took a different approach, first goal was to win my team the game ( I had a 73% win rate on my turkey account) 2 let one of the last surviving enemy players sink this bird. I specifically played BBs the most and stayed on the front line pushing the action every game. The reward system for players who killed a turkey was simple, get a kill, get the reward. The reward system for the turkeys was a bit more involved and rewarded volume of games and not quality, I understand why. Hopefully in the future a compromise for those who are playing the event accounts will be developed to emphasize a more tactically sound approach. In the end I hope most of you had fun with the event and for those of you who secured kills I congratulate you. As a turkey I had loads of fun, especially when being chased all over the map, it was great! Has the Warships wiki been overlooked? The Wiki we have here is one of the best Wiki pages in gaming I have seen. IMO the Wiki editors are top notch and do very good work add to that its volunteer work the WoWS community has been spoiled by the Wiki editors. Thank you all for the time and effort you put into the content. Episode 79 is live, enjoy! Just wanted to thank all the listeners who support the show as we have passed 20,000 downloads. It's a small but worthy milestone, thanks again! You can find the show at Warship Tactics Podcast Download the new Google Podcast App here Subscribe on Android Subscribe on Apple Podcasts Subscribe on Stitcher Subscribe on Spotify Follow me on Facebook at Maddminister Gaming Live stream on Facebook, Tuesdays at 5pm Pacific (midnight UTC) Follow me on Twitter at Maddminister@Warshiptactics Subscribe to my YouTube channel at Maddminister Gaming The Warship Tactics home page has a new player here with all episodes ready for your listening pleasure. I could not agree more. Teaching is no easy task, most are not up to the task. It's vastly easier to complain, blame, point fingers, rage or just be an A-hole in chat to those supposed "bad" players. Trying to help in chat is nearly an impossible task, I have tried. The second you make a suggestion or hint and dealing with a ship you are labeled one derogatory term after the next. I've had better luck giving advice to enemy ships who are trying to kill me in battle...IE...telling BBs to switch ammo type to be more effective. The lack of tutorials is frustrating as they seem to be an easy implementation, but I will not judge WG for it. For me I have moved on to conducing play by play commentary during my Facebook streams explaining exactly what I'm doing and why. I also talk about why something I did went wrong and point out mistakes I made and good choices made by the enemy team. The second thing I started doing was producing a podcast that aims to help players improve and understand game mechanics, 99% of the topics are based on my mistakes. "Accept the reality of the situation, and play or quit" great advice! Episode 77 is live, enjoy! Just wanted to thank all the listeners who support the show as we have passed 20,000 downloads. It's a small but worthy milestone, thanks again! You can find the show at Warship Tactics Podcast Download the new Google Podcast App here Subscribe on Android Subscribe on Apple Podcasts Subscribe on Stitcher Subscribe on Spotify Follow me on Facebook at Maddminister Gaming Live stream on Facebook, Tuesdays at 5pm Pacific (midnight UTC) Follow me on Twitter at Maddminister@Warshiptactics Subscribe to my YouTube channel at Maddminister Gaming The Warship Tactics home page has a new player here with all episodes ready for your listening pleasure. Just wanted to thank all the listeners who support the show as we have passed 20,000 downloads. It's a small but worthy milestone, thanks again! 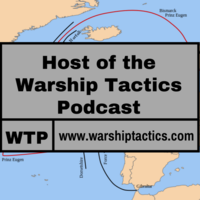 You can find the show at Warship Tactics Podcast Download the new Google Podcast App here Subscribe on Android Subscribe on Apple Podcasts Subscribe on Stitcher Subscribe on Spotify Follow me on Facebook at Maddminister Gaming Live stream on Facebook, Tuesdays at 5pm Pacific (midnight UTC) Subscribe to my YouTube channel at Maddminister Gaming The Warship Tactics home page has a new player here with all episodes ready for your listening pleasure. Episode 76 is live, enjoy! You can find the show at Warship Tactics Podcast Download the new Google Podcast App here Subscribe on Android Subscribe on Apple Podcasts Subscribe on Stitcher Subscribe on Spotify Follow me on Facebook at Maddminister Gaming Live stream on Facebook, Tuesdays at 5pm Pacific (midnight UTC) Subscribe to my YouTube channel at Maddminister Gaming The Warship Tactics home page has a new player here with all episodes ready for your listening pleasure. Episode 75 is live, enjoy! 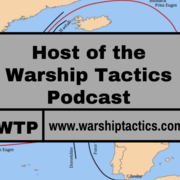 You can find the show at Warship Tactics Podcast Download the new Google Podcast App here Subscribe on Android Subscribe on Apple Podcasts Subscribe on Stitcher Subscribe on Spotify Follow me on Facebook at Maddminister Gaming Live stream on Facebook, Tuesdays at 5pm Pacific (midnight UTC) Subscribe to my YouTube channel at Maddminister Gaming The Warship Tactics home page has a new player here with all episodes ready for your listening pleasure. Episode 74 is live, enjoy! You can find the show at Warship Tactics Podcast Download the new Google Podcast App here Subscribe on Android Subscribe on Apple Podcasts Subscribe on Stitcher Subscribe on Spotify Follow me on Facebook at Maddminister Gaming Live stream on Facebook, Tuesdays at 5pm Pacific (midnight UTC) Subscribe to my YouTube channel at Maddminister Gaming The Warship Tactics home page has a new player here with all episodes ready for your listening pleasure. Episode 72 is live, enjoy! 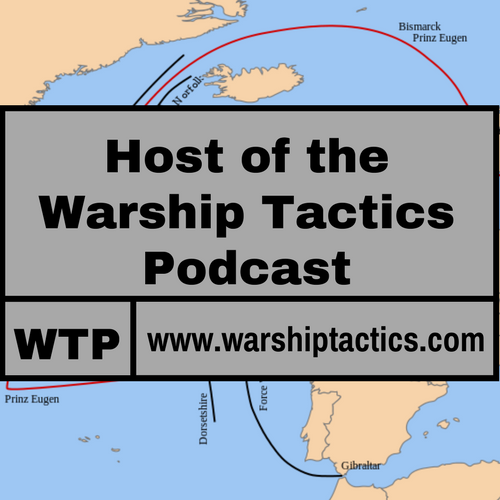 You can find the show at Warship Tactics Podcast Download the new Google Podcast App here Subscribe on Android Subscribe on Apple Podcasts Subscribe on Stitcher Subscribe on Spotify Follow me on Facebook at Maddminister Gaming Live stream on Facebook, Tuesdays at 5pm Pacific (midnight UTC) Subscribe to my YouTube channel at Maddminister Gaming The Warship Tactics home page has a new player here with all episodes ready for your listening pleasure.